Better Than Yarn: Mini and yet, mighty! Wow, you all went nuts for the meatloaf muffins! How rude of me not to offer my blog is taste-o-vision. (Please post your taste-o-vision requests here.) What I like best about meatloaf is that it's high in protein, and even higher in deliciousness. If you're short on time, or like your food portioned out for easy party-eating (or lunch packing), the muffins are the way to go. I'm going to steal borrow Mom's mini loaf pan and try it in that next, but I have a feeling that the muffins will win the day. Start with The Joy of Cooking; go buy it now if you don't already have it, and buy it locally if you can. Recycle Bookstore in Campbell is where I go for buying my cookbooks, when Laura isn't giving them to me, that is. - I mix it all together with bare, freshly washed hands. I feel that you can better taste the love that way, and we all know that love is the secret ingredient. - Cupcake tin instead of greased loaf pan. I use paper liners, and an ice cream scoop to measure out the meatloaf into the cups. - If you're doing side dishes, start them when you pull the meatloaf out to cool. The timing will be perfect. Last but not least, the other awesome thing about meatloaf is that it takes 10 minutes to throw together and then you have the whole time it's in the oven to knit. The bonus is the virtuous feeling you get when you know that your dinner is cooking away and you have nothing to do but wait for it to be done. 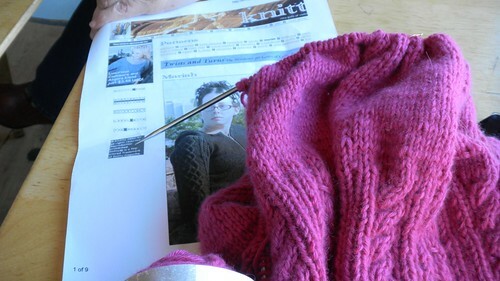 Knitty, Winter 2004. My Mariah. My foster daughter requested meatloaf for dinner (she doesn't particularly appreciate my all-vegetarian cooking, silly girl)--thanks for the reminder that Joy of Cooking (which I only recently purchased) will have a recipe for me! I will definitely have to look for this cookbook! Scooter and I prefer our foods a little (ok, he a lot)on the spicy side. We use a hot pepper sauce that can only be purchased in Kentucky, so we do mail order by the case. It's called Bottled Hell (it's not really) and is made with jalapeno, habanero, and cayenne pepper. They have an awesome recipe for meatloaf where you mix 1/4 part ketchup with 1/4 part hot sauce. If you like spicy, it's flippin' awesome!!! My mom used to make mini meatloaves for my younger sister. Thanks for the reminder! I loved your comment on the lack of a metric time unit. I feel the same! You know, I am thinking that a bit of basting with Heinz 57 just before going into the oven would make these to delicious to resist. Too bad we are already having pulled pork sandwiches tonight or might have to make these. Yeah, I recently heard that we have Byzantium to thank for our bizarre 60-minutes in 24-hours day. Everybody say, "Thank you, Byzantium." P.S. I love the podcast!